Many gamers were disappointed by the fact that video game company Bethesda chose not to release a remastered edition of their role-playing classic The Elder Scrolls IV: Oblivion (the Maryland-based developer will instead release a special, remastered edition of the more recent Skyrim this fall). After all, Oblivion certainly was one of the best role-playing games of the last decade, with its great medieval fantasy open-world, colourful characters and tons of quests to tackle. It was then, the quintessential RPG, so perhaps more than one Oblivion fan will be pleased to hear that a dedicated team of modders is working on an updated version of Oblivion named Skyblivion. The reason for the “Skyblivion” moniker is that the team over at TESRenewal is using Skyrim’s construction kit and modding tools to recreate Oblivion using Skyrim’s game engine, giving an old classic a modern overhaul. There’s no doubt that user modifications (mods for short) have been a staple of Bethesda’s games since their Morrowind game came out in 2002, letting players basically do whatever they want with the game, adding new characters, quests or even improve the game cosmetically (like this bunch of Skyrim mods do). 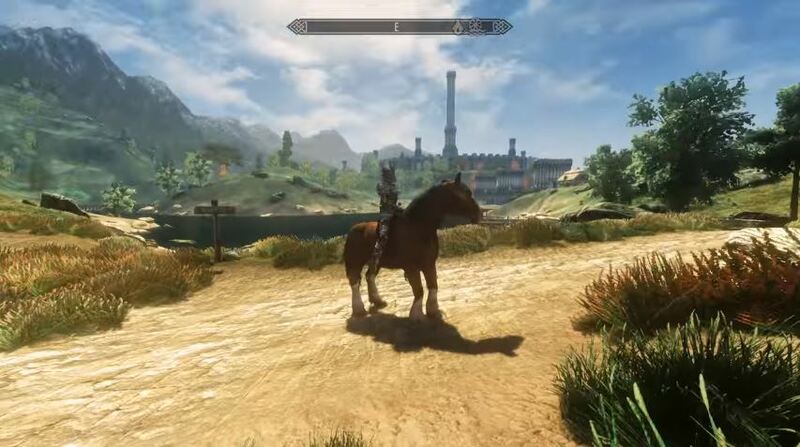 The team behind Skyblivion has released a few preview videos showing the game in action, with the video below showing the player riding near and entering the game’s Imperial City (which will likely bring back memories to those who enjoyed the 2006 classic back in the day). So will Skyblivion be the Oblivion remaster we were hoping for? It is hard to tell how well the final game will play and whether the devs at TESRenewal will manage to capture the feel of Oblivion and get the gameplay right. Another thing is how long will we have to wait for Skyblivion to be released, as the team at TESRenewal is currently hard at work on another project named Skywind, another overhaul mod which aims to recreate Morrowind using the Skyrim engine, giving the old classic a modern look and feel (plus a new feature or two according to the game’s FAQ). Skyblivion might still be a long way off then, so those looking to play this updated version of Oblivion might still have to wait quite a bit… But still, it’s exciting to know that we might still get to play something resembling a remastered edition of Bethesda’s classic RPG, if Skyblivion does see the light of day sometime in the future.